Given the last few years, it might be time to stop using the word “unusually” in concert with “strong” when talking about January releases. Of this week's four new wide releases, two look like legitimate hits that could have had a summer (let's say... August) release, while the other two, well, at least they were cheap to make. 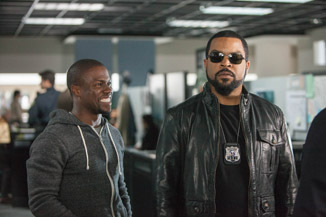 Ride Along features that pairing between Ice Cube and Kevin Hart that we've always (?) wanted. Hart plays a man dating Cube's sister. Since he's a police detective and doesn't think Hart is man enough to date his sister, his only natural option is to hijack him into a ride along to see what he's made of. Before you can say “misuse of department property”, we're into a buddy comedy filled with intimidation and dangerous negligence. This film also threatens the nation's precious stockpile of “Kevin Hart is really short” jokes, which started to accumulate after his standup concert films, but have slowly been whittled away in his feature films and Ride Along seems to consist of nothing else. It's like making a coat out of spotted owl down – sure you can do it, but leave some for the rest of us, okay? Anyhow, the ride along turns into a pursuit of one of Atlanta's most notorious criminals, inevitably pressing Hart into a fish-out-of-water role where he has to be involved in bringing down a gun racket. As one does when on ride alongs.